The kids really enjoyed doing the eggs this year. They thought it was pretty cool that we could make our own dye. My husband loved it too because everything smelled so good! We experimented with just a few colors since we weren’t sure how things would turn out. The blueberries gave us the most vivid blue, and blackberries made a lovely blue-violet. Both of these came out of the dye a different color then they ended up, so that added excitement too. The blueberry ones looked more violet, and the blackberry ones were pink. We had a much harder time with the yellow. These were done with a combination of paprika and cumin, but only one turned out really vivid, most were a pale yellow. I was able to make one greenish one by dyeing in yellow first, followed by the blue, but I couldn’t get it to take the yellow after that! 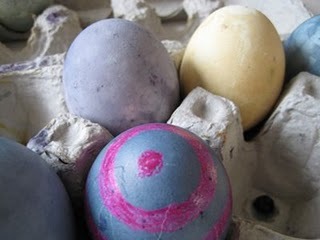 On a few of the eggs, the kids made designs using their beeswax crayons to add a bit of decoration. 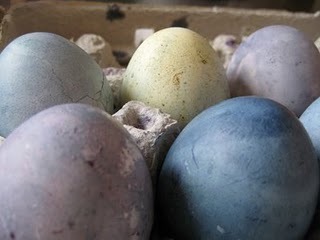 We tried a spinach dye as well, but the color was extremely faint, so maybe I should have used more spinach. It really was quite fun. Hopefully next time I will plan better and we will get more colors!